Betsoft may not have as much experience under its belt as some industry veterans (RTG & Rival in US or Microgaming and Playtech globally), but it’s always put itself at the forefront, trying to compete with the best with mixed results. Clearly, it had high aspirations, as it even laid claim to royalty with this release back in 2011. 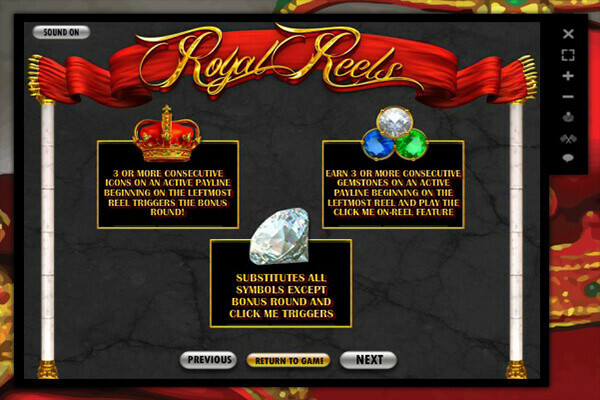 Coming back to Royal Reels slot, we’re surprised at how well it held up. Naturally, the graphics aren’t as impressive as they used to be, but keeping things relatively humble allowed them to age well. There are no awkward humans that cause the feeling of uncanny valley or animations that try too hard but turn out choppy. 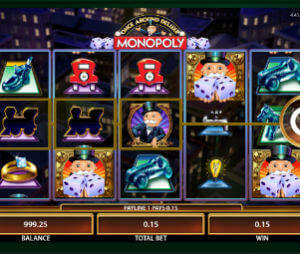 The gameplay is also likely to feel very familiar to anyone who’s ever played a slot before – while there are no free spins, there’s a lot of collecting going on, all in the name of shameless profit. The game offers medium volatility with an RTP of 95.5%, which sits about average for online video slots nowadays. Betsoft itself has much looser slots, such as Good Girl Bad Girl and At the Copa. Simplistic fun – There’s really not too much to keep track of with this title. You need to remember that diamonds are Wilds, that the crown and gemstone need to be collected in order to activate their bonus, and that you can make all the magic happen by pressing the spin button over and over since Autoplay still hasn’t made an appearance at this point in time. It’s a refreshing step away from modern titles that can sometimes have multiple pages explaining all of its bonuses, but it doesn’t go too far as to get rid of all of its features either. Decent visuals – honestly, when you compare it to some other titles, it’s insane how well Royal Reels held up as far as graphics go. You won’t be getting mind-blown with graphics like a NetEnt slot, but it doesn’t gauge at your eyes either. Any title that’s this old and still manages to look decent deserves a plus in our eyes, if for no other reason than because our eyes are quite thankful. No fun features –This may be more subjective, but there’s really an absence of actually fun bonuses. Both of them boil down to collecting a certain set of symbols and then clicking them afterwards to pick up your reward. The prize is great, but it’s hardly the most engaging thing as far as gameplay goes. There are two of them in total, but they’re so similar, we’re just going to cover them together. Landing three gemstones, emerald or sapphire, will highlight those three symbols. Picking one of the three rewards a cash prize for the player. The second bonus does the same thing, only this time, it’s crowns instead of gemstones, and there are five crowns instead of three. It feels a lot smoother than some other older titles we’ve reviewed recently. It doesn’t really do anything amazing, but it does what it sets out to do really well, and knowing where to limit its ambition allowed it to age well and be fun to play even nowadays.